Note: Today is day 8 in my series "30 Days of Thankful." In the process of rebuilding my life and essentially starting over I've had probably too much time to think about nearly everything. 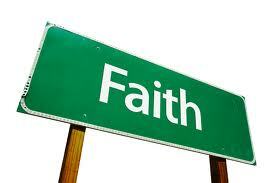 And one of the things I've thought a lot about lately is faith. I was never baptised. I went to Catholic church as a kid to spend time with my grandpa and to rebel against my parents more than anything else. Ironically, I think I've only dated Catholics, so I've spent a bit of time in church on the important holidays as an adult. I was on the path to convert to Catholicism when I started dating my ex boyfriend years ago, but I was too afraid to spend time away from him at the beginning of our relationship (hello, codependency) to go through with the process. In hindsight, if I'd actually stood up for myself and converted, that would have eliminated a bunch of our issues, but I can't seem to find the rewind button for life. Early in September, days after I'd moved out of my ex's house, I was headed to a Cincinnati suburb for a work trip. I've always liked traveling. But in all honestly, the part of traveling I enjoyed the most was coming home. When you travel, you really get a good feel for the things in your life and your daily routine that you like and appreciate. My favorite game to play was "guess whether there will be flowers waiting for me" when I got back and it was really nice to feel missed when I traveled. My heart really wasn't into this trip. I was feeling bummed out - just because. It was a grey, gloomy day, and I couldn't find any coworkers to make the 4 hour trip with me. I headed out early in the morning so I'd have time to meet a friend in Columbus for lunch. But...my tire light came on near Lodi. I've had issues with my tire sensors, so I hoped it was nothing, but I pulled off the highway into a travel plaza to be sure. My tire was flat as a pancake. Kind of sucky. And I'd never actually put air in my own tires before, but I figured I could do it. When I went to put air in, the valve popped back into the inside of the tire. FAIL. Thankfully, I have roadside assistance on my insurance policy, so in about an hour, a nice man was able to come and put a donut on my car. Meanwhile, in that hour I spent waiting, I grumbled to myself about the catastrophic state of my life. When I wasn't obsessed with feeling sorry for myself, I used my Yelp app on my phone to find a shop to take my car to so my tire could get looked at. I figured I probably shouldn't drive hundreds of miles on a donut. I was lucky to find a Mazda dealership nearby in Wooster. Which was awesome because I have a Mazda and I knew that something special would have to be done to my tire sensor to get it fixed. I called ahead and explained my situation. The service manager was very nice and promised they'd get my car right in. As I made the drive from Lodi to Wooster, I cried the entire way. I really felt helpless, hopeless, and alone. In the past when I'd had a catastrophe like this, I'd always had someone to turn to. It was kind of hard to feel so alone so far away from home. But then I had a George Bailey moment (a la "It's a Wonderful Life") where I begged and pleaded with God, the universe, and anyone else who was listening to catch a break because I was really feeling weighed down. In my weepy state, I said a special prayer to my ex boyfriend's brother Tommy. I never got a chance to meet him because he passed away in a motorcycle accident while my ex was in high school, but his presence was in our lives daily. (I prayed to him often when I needed guidance in my relationship with his brother - even went to his grave on my own once to have a little chat about the state of affairs) He went to college in Wooster, and has a memorial tree planted there, so in my mind, I felt like if there was anyone who could look after me in that sad moment, it was him. I asked for a sign to let me know that everything was going to be ok in my life and that things were going to get better. I arrived teary eyed at the dealership. I'm guessing I looked like hell or the service manager is just an overly nice guy because he ushered me and my car right in. I told him - honestly - about how I love my Mazda and how I'm very brand loyal. (it's true - I don't know if I'll ever switch) He let me know that I had an outstanding recall item and promised to get my tire fixed and the recall issue in no time flat so I could get back on the road and get to work. I waited in the lobby and about an hour later the service manager came to get me. He told me everything that they had to do and I just sort of nodded, not really listening, because I was afraid of what this repair was going to cost me. He told me I could be on my way and I got confused. I asked him what I owed. He told me nothing. A regional service manager happened to be in the dealership and had heard my story and me gushing about Mazdas, so they comped my $172 repair bill. I thanked the service manager up and down and left. Could be a coincidence, but if this wasn't the sign I'd been asking for, I don't know what is. I took a little detour on my way back to the highway. I was right near the College of Wooster, and I decided to go visit Tommy's memorial tree to say "thanks." I'd never been on the campus before and it's really very beautiful. Even on a rainy day. I'm fairly certain I found his tree, but if not, my heart was still in the right place. I said a little prayer and said "thank you" for restoring my faith. As I drove away, a little ray of sunshine poked out for behind the clouds. I smiled, turned up the radio, and had one of the best car karaoke sessions of my life. In that moment, I felt safe, loved, and I realized things in my life were only going to get better.